Qualified Mortgage guidelines alone will curtail risky lending. Imposing additional risk criteria would needlessly shut out many borrowers, particularly low-income borrowers and borrowers of color. 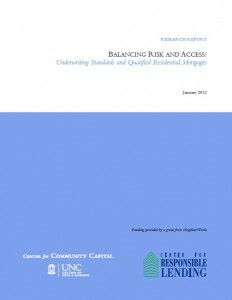 As policymakers develop underwriting guidelines for qualified residential mortgages (QRM) — which are exempt from risk retention requirements for privately securitized mortgages under the Dodd-Frank Wall Street Reform and Consumer Protection Act — both consumer and industry groups have raised concerns about the disproportionate impact that restrictive QRM guidelines may have on low-income, low-wealth, minority and other households traditionally under-served by the mainstream mortgage market. This study examines the way different QRM guidelines may affect access to mortgage credit and loan performance, with a special focus on historically under-served households. More narrowly, it estimates the additional impacts on defaults and access resulting from setting QRM underwriting guidelines over and above the proposed product restrictions for qualified mortgages (QM), which exclude loans with features associated with higher default rates such as lack of income documentation, hybrid adjustable-rate mortgages with teaser payments, interest only and balloon payments and negative amortization. To estimate the relative changes in mortgage default and access that would occur under different QRM underwriting thresholds, researchers use a unique, nationally-representative database on loan performance that includes information on loan characteristics and borrower demographics. They find that the added benefits of reduced foreclosures resulting from restrictions beyond the QM product requirements do not necessarily outweigh the costs of reducing borrowers’ access to QRM mortgages. In particular, loan-to-value (LTV) requirements of 80 percent or 90 percent produce a smaller benefit when the resulting reductions in defaults are weighed against the number of borrowers excluded from the market. The results for debt-to-income (DTI) and borrower credit scores similarly show that the most restrictive thresholds are less effective because they exclude a larger share of borrowers in relation to percent of defaults they prevent. In addition, they find that more stringent LTV, DTI and credit score requirements could disproportionately deny low-income borrowers and borrowers of color access to QRM mortgages. This research suggests that the QM loan term restrictions on their own would curtail the risky lending that occurred during the subprime boom and lead to substantially lower foreclosure rates without overly restricting access to credit. Based on this analysis, researchers believe that policymakers should not impose additional LTV, DTI and credit score requirements on QRM mortgages, especially given the potential disproportionate impact of these thresholds on low-income borrowers and borrowers of color.